Maritime workers are just hours away from kicking off our national Day of Action to protect the Liberal government’s plans to dismantle the Canadian maritime industry. Time to lace up your marching boots and hit the streets. We need to raise our voices and make it clear: Hands off our docks! Leave Canadians on deck! We’re already getting some attention. Andrew McLeod has a story in The Tyee. Stay tuned later today for more on how things unfold and a look at how things sounded in the streets. ITF (International Transport Workers’ Federation) leaders have spoken out in support of mass union actions later today in Canada to protect maritime workers’ jobs and skills. Workers and concerned citizens will be rallying in Montreal, Toronto, Prince Rupert, Victoria and Vancouver in defence of maritime cabotage, which helps safeguard jobs in national trade. Despite its proven advantages and union victories to uphold it (see https://goo.gl/J5Z4EE), the principle is under Canadian government attack. ITF general secretary Steve Cotton added: “We’re glad to see the ITF standing as part of this important national initiative that seeks to keep Canada strong, skilled and employed. Time to get your elbows up, brothers and sisters. If this rockin’ duo of Billy Bragg and Brother Rob Ashton doesn’t get your fist raised and your feet marching, well, you might want to sip of a little of this to prime the pump. And maybe a chaser of this. You can leave your comments below. Solidarity, right? Solidarity is more than a slogan. It’s a muscle. And that muscle just moved $261,346.53 US — more than a quarter-million dollars — into the pockets of 19 Filipino crew who had been cheated of that much in wages when they sailed into Vancouver Monday. As we reported Tuesday, the crew of the Ben Wyvis had just arrived from a month at anchor off Vancouver Island to load grain. Wages that support families, pay rent and school and medical bills back home, that should have provided their families a Christmas, had been withheld for three months. Food on board was running out. And more than half of the crew had been trapped in their workplace for months past their contracts’ return-home date. Today, they were paid out in full — both the allotments that should have been sent home to family accounts, and the on-board pay that keeps them going during brief stopovers in ports while working. The 12 of the 19 crew whose contracts have expired are being repatriated today. It’s too late for the Christmas they missed — which came on top of the Christmas the year before that they had been away working as well — but we wish them a safe and joyous return. It’s a great lesson to all of us as we move into formation for 2017. Solidarity matters. The Ben Wyvis flies a flag of convenience. It’s registered in the Marshall Islands, providing the owners and operators the lightest and friendliest of financial and regulatory burdens on earth. It also provides them the ability to exploit vulnerable crew. Let’s be clear. The Greek managers of the vessel agreed to pay the wages owing only because they faced the risk, and the wrath, of the labour movement that stood up to them. The ITF was able to board, determine that the wages were owing and demand that they be paid by up by this morning. We do so on the strength of the solidarity of the world’s transport unions, the contracts we have fought for and continue to defend daily, and the international conventions that we have battled into place. In Canada, in the case of the Ben Wyvis, ITF Canadian Coordinator Peter Lahay was able to make it clear to the ship’s operators that should they fail to pay up, Transport Canada would be called in to detain the ship for breaches of the collective bargaining agreement and the Maritime Labour Convention — a tool won only through the strong, sustained and focused work of organized workers around the world. We’re pleased for the crew of the Ben Wyvis. We remain concerned, though, as the ship sails for Ecuador today with its load of Canadian wheat. The company appears to be operating six ships, and appears to be troubled, and we can only assume those crews are faring no better than the ones we had the honour of assisting in Vancouver. We thank our brothers and sisters in Canada and elsewhere for their interest in this case and the support they have shown. And we ask that your energy is directed to our next battle in Canada: the sellout of Canadian maritime jobs. Ratification of the looming CETA trade deal between Canada and the European Union will mean the shameful theft of decent maritime jobs now guaranteed by law to Canadians, and the right for international operators to replace our workers with vulnerable and exploitable foreign crew. Enactment of recommendations of the hypocritical Emerson report on changes to the regulations governing Canada’s transportation industry will spell the end of cabotage, the law that protects Canadian coastal trade. Cheap and vulnerable foreign crew will flood our ferries, tugs, barges, ships and docks, and all the trucking and drayage connected with them. One Ben Wyvis is one too many. We cannot allow their employer’s disgraceful behaviour — and the behaviour of the other bottom-feeders in the industry — to define maritime work in Canada. And we should not design a world in which workers are assigned the role of mopping up the mess left by disproportionately corporate-friendly trade deals. We’ll be raising our voices on Jan. 12 on just that topic. You might want to stay tuned. For a couple of years now, Canada’s seafarering and longshore unions have been sticking our fingers in the chest of our federal government, trying to get them to understand that their corporate-rights deals — like CETA — will cost Canadians high quality maritime jobs and invite open exploitation of foreign workers. But sometimes real life screams louder than we ever could. Just ask the 19 Filipino crew of the Ben Wyvis, a bulk carrier that just motored in to the Port of Vancouver to load Canadian wheat bound for Ecuador. None of the crew has been paid in three months — which means no money has gone home to families in the Philippines for rent or food or medicine or school expenses, or for Christmas. Pay on-board — the little slice of money that tides seafarers over during their months at sea and brief port visits — hasn’t been paid either. The unpaid wages as of year’s end totalled more than $260,000 US. More than a quarter of a million dollars. Imagine. Eleven of the 19 men have been on board that ship since Dec. 18 of 2015, well past the 10 months they had contracted to work. They just spent a second straight Christmas on the ship, without seeing home at any point between the two holidays. Again, imagine. In a final insult, food was running short as they sat at anchor in Houston Pass near Nanaimo for a month, waiting for their cargo to arrive in Vancouver and the ship to be called alongside to load. Lahay investigated and has found the claims were true. The monies are in fact owing. He has contacted the ship’s managers and the crew managers to demand that all crew be paid up in full until the end of December. A full answer and a confirmation of payment was needed by Wednesday, Lahay has told them, or Transport Canada will be asked to investigate and detain the ship under breaches of the collective bargaining agreement and the Maritime Labour Convention. On the one hand, the case is the same kind of job that ITF inspectors in Canada, and around the world, do every day: enforce and defend seafarers’ contractual rights. On the other, it couldn’t be a clearer or more timely example of why we have also stepped into the fight to protect the jobs of Canadian maritime workers, now under massive threat as the federal Liberal government moves to finalize new trade deals and gut the laws and regulations that govern Canadian transport. We have spoken out about Canada’s disgraceful pursuit of a free trade deal with Europe. Stay tuned. We’ll be cranking up the volume again on Jan. 12. More on that later. The end goal of the Liberal government, like the Conservative government before it, is clear: to steal the jobs now guaranteed by law to Canadian maritime workers, and to allow companies to replace those workers with cheaper and more exploitable labour. You don’t have to look any farther than the men aboard the Ben Wyvis, sitting at one end of the spout that will move grain into their ship. The able seamen, who provide qualified labour, make $3.22 an hour. They have been held in the ship, their workplace, three months longer than they agreed to work. They have not been paid during any of that time. And if they complain, they will lose their jobs and face possible blacklisting, ruling out any future work. At the other end of that spout is a Canadian grain worker, whose paycheque arrives on time, who has a labour board to back him up when a dispute arises, who doesn’t fear blacklisting should he speak out against his employer — and his employer knows that. The Ben Wyvis flies the flag of the Marshall Islands. It is managed in Greece, which is part of the European Union that our political leaders have told us — over and over again — holds the trade key to our prosperity. Lahay, now awaiting word on whether those Greek managers will agree to pay their workers the wages they have been cheated of, says his latest case a clear warning of what the deal really means. “The Liberal minister wept with joy when the deal was signed,” he says. “We should all be weeping. We are letting this industry take jobs from Canadians and replace them with some of the world’s most marginalized and isolated workers. On the Ben Wyvis, they exploited the crew openly, brazenly. They know the men won’t complain about food until they are nearly starving. They know they can cheat them. The fear in that email, that heartbreaking plea to keep his email and his name secret, tells you all you need to know,” Lahay says. We’re back from the ITF MRT in Montreal fully energized, having sharpened our campaigning skills and our commitment to solidarity in action. Our biggest lesson? To quote Canadian punk legend Joe Keithley of DOA, talk minus action equals zero. During the week in Montreal, labour activists from around the world were put to work in lively participatory sessions meant to “agitate, educate and organize”. Sometimes the “agitation” is as simple as one heartfelt story that says everything about how the effort to support transport workers can make a real difference. We’ve got one of those stories for you this week. In Montreal, we invited The Docker Podcast team to plug in to a live session on how we can harness our own unique skills to further the many worthwhile campaigns underway, identify new struggles and take effective action. And then we had them record the dark and dramatic words of Brother Shwe Tun Aung, who we have written about before. The podcast captures Shwe’s own story of his grim life as a Burmese seafarer — and his lonely struggle as a man without a country, ultimately saved by perseverance and solidarity. Shwe repeated his story four times to sessions that day. “Compelling” doesn’t begin to describe his words. In some sessions, activists rose and gave him a standing ovation; in other sessions, they were moved to tears. Our solidarity with Shwe and IFOMS, the new Burmese seafarers union, remains strong. This week, Vince Giannopoulos, the ITF’s inspector for the Great Lakes/St. Lawrence region, and Transport Canada stopped and detained the Marshall Island-flagged Merlin in Sept-Isles for non-payment of overtime wages to the Burmese crew. Nearly $12,000 US was recovered and returned to the lower ranked crew. It’s always a special moment when we assist Burmese seafarers. Just two short years ago, it was illegal for them to accept the assistance of international trade unions when they’d been robbed of wages. Shwe’s story is the story of how all that changed. So settle in for the next 40 minutes for the details of his struggle, told in his own voice. You mind is about to be blown. Like a lot of maritime trade unionists, we’re packing our bags and heading for the ITF Maritime Roundtable in Montreal. This week’s Saturday Listen invites you to think about one of the big problems we’ll be wrestling with. Start here: In North America, the working class squeezed a first round of big gains from employers and governments after the great depression, between the two world wars, in what was known loosely as the New Deal (1933-34). Then consider this: Beginning in 1945, after the end of the Second World War, workers began to gain more broadly. Pay and conditions in Europe and North America continued an upward trajectory throughtout the ’50s, ’60s and ’70s. And then bosses, governments and the establishment mounted a massive push back. Throughout the developed world, workers and their trade unions were challenged — and sometimes smashed. Think about the Reagan/Thatcher years, when tens of thousands of air-traffic controllers were sacked in the US, while in Britain, Thatcher took on miners, pressmen, seafarers and dockers. Our point is not to catalogue the incredible assault on workers’ conditions over the past 30 years, but to set the scene for this episode of The Docker Podcast. In it, the Podcast team speak with Zach Pattin from ILWU Local 23 in Tacoma and Kyle McGinn from the MUA. The were gathered in Tacoma to mark the struggles of earlier generations and to analyse where workers stand now — and what they’ll need to do to wrestle back some of the conditions won by their grandparents and lost during their parents’ working lives. It’s the same analysis we’re doing in Montreal this week as we meet to renew ties of solidarity and to plan the critical campaigns that are built on it. We’ll let you know how it goes. Meantime, enjoy the podcast. Share it, and share the conversation. And don’t forget, it’s not too late to get in on our contest! Shipowners are gnawing at us. We’re biting back next week. It’s never been clearer that dockworkers and seafarers labour on the front lines of globalization. It’s equally clear that much of the shipping industry — through lack of discipline, lack of regulation and eternal and blindly optimistic greed — is now teetering on the brink of insolvency. Everywhere transport-trade unionists look, we see employers trying to stop the hemorrhaging — most often on the backs of workers. The most cynical of corporations are actually seizing the moment to regroup and to redouble their assaults on workers. For all workers, the answer is to join hands and resist with equal determination. The ITF is leading that movement. Canada will host the federation’s Maritime Round Table in Montreal Sept. 20 – 23rd. This major international maritime event, organized in the form of a roundtable seminar, is held once every four years and aims to support and further the development of the next generation of maritime labour leadership. This year, the four days will be dedicated to helping maritime union activists identify, develop and undertake campaigns in support of their own memberships — and to make meaningful contributions to global maritime solidarity. We’re gathering under grim skies next week. Memories of the financial collapse of 2008 are still fresh in workers’ minds, and the ongoing failure of Hanjin looms large over us. The financial collapse of the South Korean shipping giant serves to highlight the deep problems of a shipping industry crippled by over-capacity and too little cargo. Workers are always the most vulnerable party in such failures, and we meet in Montreal in common cause with the seafarers who crew Hanjin’s fleet. The solidarity of the ITF and its affiliated unions is the first, and sometimes only, line of defence for those workers and the families they leave behind. Against this backdrop, more than 150 delegates will attend an inclusive and interactive seminar. Canada’s ITF inspectors and our two main campaigning unions — the Seafarers International Union of Canada and the International Longshore and Warehouse Union Canada — will play host to the delegates, as well as dozens of maritime union leaders and ITF staff. Our Canadian inspectors and unions are taking their responsibilities seriously. All three Canadian ITF inspectors are attending as facilitators and each of us will bring our practical experience to forums and workshops. Our Canadian unions have played a massive role in organizing the gathering — especially SIU of Canada, which as the home union based in Montreal has shouldered the burden of organizing everything from support letters for delegate visas to the venue itself, and planning for the outside activities that generally surround our seminars. All of this is enormous work, and we give them a tip of the cap. The ILWU Canada is pitching in with its own special initiative on Sept. 21 with an evening event that will share lessons learned in two years of steady work to revitalize activism in the union — and a blueprint for others to take home and customize. The session will include a presentation on the evolution of the ILWU’s young workers movement and an undoubtedly lively live recording session of The Docker Podcast. As part of the presentation, the young workers have launched a social-media campaign and photo contest for delegates to the MRT. We liked the idea so much we’re opening it up to all of our readers. Delegates are being encourage to print off the poster found here, sign their name in big, readable letters — and then take a creative photo of themselves holding up the poster. The photo should be posted on social-media platforms using the hashtag #iampartofthemovement. The best delegate photo will receive a gift from the ILWU Canada. We at the ITF Canada are spreading the solidarity joy by encouraging all our readers to do the same. Non-delegates will be eligible to win a special prize from us. All you have to do is add the hashtag #ITFCanada to your post as well. You can learn more about the roundtable here. It’s going to be an awesome event, and we’ll be reporting back to you on it when it’s over. Labour Day celebrations feel bittersweet for us this weekend. There’s much joy in honouring the rights that workers have struggled to win in Canada, given the high cost they’ve paid for them. But it’s a sombre celebration when on our own West Coast — and around world — maritime workers are caught up in the bankruptcy of shipping giant Hanjin. All of us have seen the troubling headlines about the South Korean company’s financial collapse. In Canada — alongside at Deltaport in Vancouver and at anchorage in Prince Rupert — crew of two of the 140 or so affected ships were caught up in the mess. For all of the apparently arcane financial details, the bankruptcy is at heart uncomplicated: depressed freight rates and too many ships. It’s a man-made problem. Greedy shipowners overbuilt and relentless financiers aided them in their race to the bottom. In a nutshell, it’s capitalism at its finest. What the collapse meant is that around the world, seafarers aboard Hanjin’s container ships, owned or chartered by an already troubled company, woke up last week to grim news: Their employer had gone bust, they might or might not get paid, and they might or might not be flown home. Their wages might come one day, but that day might be months away and might come only after a long fight for the money. In the meantime, families waiting at home for allotments to cover rent, grocery and school bills might go without cash too. At worst, workers knew they faced the possibility of abandonment. Abandonment happens all too often in Canada. And it is a disgrace. Croatian and Greek crew of the Navi Wind were abandoned for weeks in Argentia in the bitter depths of a Newfoundland winter until Gerard Bradbury, then our Atlantic inspector, helped win them $100,000 in back pay. Twelve Turkish seafarers on the Phoenix Sun were marooned in Sorel, Que., when the ship’s owner refused to pay for repairs; it took the ITF’s St.Lawrence/Great Lakes inspector Vince Giannopoulos to organize the support to fly them home. The 25 Indian crew of the Atlantis Two were abandoned in Vancouver when they arrived to load $4 million in potash and the ship was detained for $400,000 worth of structural repairs that the owners refused to pay for. ITF Canadian coordinator Peter Lahay eventually pried loose their $300,000 in backpay in a court case a year later. Just this week, 20 Chinese crew aboard the Five Stars Fujian, abandoned three weeks ago without pay and in need of food at anchor off the Port of Gladstone in Australia, were finally awarded back wages with the help of ITF inspector Sarah McGuire. This Monday, Canadians are celebrating the rights that workers here fought hard to secure. Seafarers aboard Hanjin’s fleet have extensive rights, equally hard-won. They’re covered by collective bargaining agreements backed up by an international convention, the Maritime Labour Convention. (In fact, the most recently negotiated amendment to the MLC is a requirement that shipowners have abandonment insurance). Seafarers’ rights were won through organized and structured flag-of-convenience campaigns run by maritime trade unions around the globe, backstopped by strong dockers unions and the solidarity they extended. We’ll be celebrating those victories won by seafarers and the 140 ITF inspectors around the world who organize ships into the agreements that protect workers — and enforce them once they’re in place. But we’ll be celebrating in the shadow of the lesson of Hanjin: that there is no certainty in capitalism. Our present economic system doesn’t serve everyone’s interests. Hanjin’s executives may sail away with their bonuses, but workers, their families and their communities have not been served. Hanjin’s troubles will take weeks, maybe months, to resolve. The repercussions make take years to rattle through the industry. We will have more to say on this in days to come. For now, we wish workers everywhere a moment of peace this Labour Day. Today, we salute and honour everyone who labours for a living, and especially those who at such great personal cost move the world’s goods, power our economies and make possible the world’s wealth. We will continue to stand in solidarity with you, brothers and sisters. Steve Cotton talks with Podcasters Mike and Dan at an ILWU convention in Hawaii, 2015. For your Saturday Listen on this Labour Day weekend in Canada, we dug back into the archives of The Docker Podcast for this compelling chat with ITF General Secretary Steve Cotton. We’re serving this up as the week’s Listen for a couple of reasons. 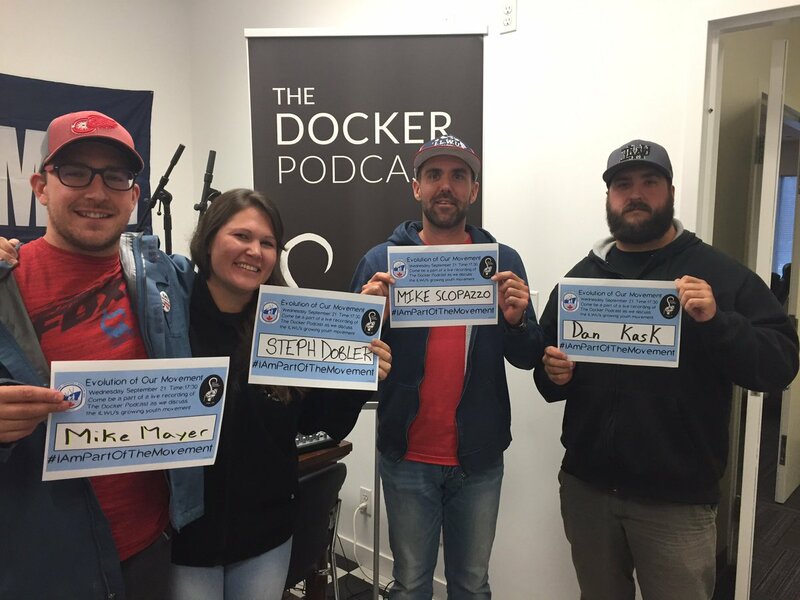 It’s a big shoutout to the Dockers Podcast team of Dan Kask, Mike Mayer and Mike Scopazo, all members of ILWU 502. More recently, Local 502 casual member Stephanie Dobler has joined the gang. In this podcast, Cotton and the crew chew over the ITF’s dynamic new direction and its global campaigns. And they draw a roadmap for building a strong international trade union movement and using new mediums to communicate with a new generation of members. The Podcast team, who are based in BC, will be taking their roadshow to the ITF Maritime Roundtable in Montreal this month. Given their sass, solidarity and experience in organizing real solidarity for workers in struggle, we know they’ll play a big, beautiful and rowdy role at the roundtable gathering. We also hope this podcast with Brother Cotton will remind transportation workers where the big struggles are, where we need to take the labour movement — and how all of this fits into the local and global agenda for workers. A big Labour Day salute to Dan, Mike, Mike and Stephanie for their part in building solidarity in Canada over the past year, and to Steve Cotton for his role in rebuilding and strengthening the ITF structures so critical to organizing and delivering global solidarity. It’s September. And we’re back blogging after a busy summer helping with training and solidarity work, and assisting seafarers who were injured or hadn’t been paid or were trapped aboard by owners too cheap to fly them home as their contracts ended. Look for a lively fall offering from the ITF’s Canadian inspectors team. The three of us travel this month to Montreal for the Maritime Roundtable 2016. That’s where activists and upcoming leaders from the world’s maritime labour family will meet to share ideas on organizing and campaigning and prosecuting our Flag of Convenience campaign on behalf of seafarers. Canadian maritime unions are delighted to be welcoming international delegates with such shining activist backgrounds in solidarity work. Our own inspectors — Karl Risser, Vince Giannopoulos and Peter Lahay — are looking forward to working with them, and delegates should feel free to tap us for anything at all they need during their stay. We’ll be meeting against the grim backdrop of the Hanjin bankruptcy, something we’ll be addressing in later posts. The situation is likely to take some time to resolve; look for us to weigh in as it does. We’ll also be introducing our entire team of inspectors soon, now that we’ve all settled into our work. Our time on the gangways has only strengthened our resolve to lean in to the job of assisting the workers who move the world’s economy, often at a considerable personal cost. And of course we’ll be reporting in on cases across the country as they arise. It’s nice to be back in touch. Yesterday, I woke up to an email from a desperate Filipino seafarer aboard the Cyprus-flagged Paraskevi, a Greek-owned bulk carrier that’s alongside the Fraser Surrey docks in Vancouver. His father died on May 31st and he had been begging for weeks to get off the ship to fly home, comfort his family, pay his respects and bury his dad. The shipowners were claiming they had been trying to get him home, initially from Hawaii and now from his latest port of call, but had been unable to get a visa for his replacement. The email I opened when I woke up Saturday was his plea to the ITF for help. He had been waiting 20 long days at that point to bury his father. I knew what had to be done, and I did it. I’ll spare the details, but can report that the company is no longer concerned about getting the man’s replacement onboard. They are concerned that we will take action if the man is not flown home. I will think of him this Father’s Day as I sit down to lunch with my own kids, and as I salute my own dad. I’m posting some of the email chain from the case here, with details removed for privacy. It’s a glimpse into one part of the cost that seafarers, away from home for births and deaths and most of the celebrations that the rest of us enjoy, pay for their work in moving the world’s goods. I am Electrician (name deleted), a Filipino residing in Philippines, presently onboard the MV Paraskevi (IMO:9254111), we are now in Fraser Vancouver Canada loading grains and our departure will be on June 19 sailing to Alliance Vancouver Canada loading again grains for 3 days then depart to china for discharging. Sir I tried to communicate with you to hope that maybe you could help me or give me some advice because now I don’t no what to do and I’m really confuse and have a lot of worries. Anyway, my beloved father died last May 31 while the vessel is in Hawaii USA and on the next day I made a letter sent to the principal requesting for an emergency and immediate repatriation signed by both captain and chief engr. A constant communication and follow up calls (via telephone and vessel’s satellite phone) has been made by myself and member of my family to the manning agency in Manila Philippines regarding my reliever and repatriation. The repatriation in Hawaii was not materialize because as explained by the principal that time is extremely limited to find my reliever with US visa as well as I don’t have a Visa but I understand that this is beyond principal’s control and efforts, however, the principal advise me in writing that they are obliged to postpone my repatriation in next port (which is Fraser Vancouver Canada). The vessel left Hawaii last June 7 and arrived in Fraser on June 15. However, for your information only, last June 5, (just to remind the principal of my intention to go home and to re-emphasize to them again that my family is waiting for my arrival to set the schedule of burial of my beloved father), I wrote another letter requesting for repatriation in Canada. A follow up calls to Manila office has been constantly made. On June 9, I learned from Manila office that they already had an approved reliever pending and waiting for the advise/approval from principal to proceed for the application of Canadian visa. As per Manila office advise, visa processing is 7 working days. I was so disappointed to know that it took few days to received principal’s approval to proceed with visa application. Only last June 15 that my reliever applied for visa which I think that it’s too tight and its late to catch up vessel’s departure in Alliance Canada (ETD: June 22). Death of an immediate member of family, is I believe, considered as an emergency and urgent matters. Due to urgency, I was really expecting that I will be repatriated right away upon our arrival here in Fraser last June 15, but to my dismay I really wonder why only when we arrived here that’s the time they had process the visa wherein there was enough time to process it earlier. With this, I think that they didn’t pay attention and no urgency at all or maybe there was lapses on their side which is so discouraging on my part because of my situation. Sir please I need your advice on how to handle this properly, my intention is to go home ASAP, I could no longer afford to wait another couple of days. Sir can I still disembark here in Fraser? What about my documents, is captain oblige to return my docs? Will the agent or principal assist me when I disembark? What if nobody will assist? What about the repatriation cost who will shoulder? Anticipating my heartfelt thanks for your prompt advice, assistance and help. P.S. I will send to you in separate email a photos of my letters, reply from principal and my contract with detailed informations just in case you will need as reference. After offering condolences, letting the seafarer know he would investigate and take next steps, Peter was able to board the ship by shortly after 9 a.m. the same day to let the man know the company had agreed to fly him home the next day. I was stunned and surprised by your utmost attention and prompt action. I almost can’t believe to see you personally here in the vessel this morning and assured me of your full support. Sincerely speaking, upon seeing you I really feel a savior came… because I am in a very bad situation that I thought my employer can help me but unfortunately it became worsen in this time of sadness. Anyway, sir I just want to express a million thanx to you…most especially the ITF organization! By the way, I already have with me the airplane e-ticket and my flight schedule going to Philippines will be on June 20 and arrive on June 21. I am now rest assured that I can pay my last respect to my beloved father and see him one last time. The schedule of burial is now being set 2 days after my arrival. Sir I will advise you once I arrive home. Once again, thank you so much and more power to you! Your Saturday Listen: We cover the waterfront. Including beer. ITF Canadian coordinator Peter Lahay (second from left) joins the Docker Podcast team — Mike Scopazzo, Dan Kask and Mike Mayer — to model their new solidarity t-shirts. Three committed young labour activists sit down to talk with ITF Canadian Coordinator Peter Lahay. You’ll never guess what happens next. Hint: It includes Polish Solidarnosc workers, Arab trade-union struggles — and making wise beer choices. You can enjoy the latest Docker Podcast podcast here. ITF Atlantic inspector Karl Risser (centre) reunites with crew of MV Goodwood in Port of Halifax, January 2016. We’ve got a quick dispatch from Halifax, and it’s the kind of news that makes us feel good about our work – and about the real-life value of solidarity. This week, the ro-ro vessel MV Goodwood swung through Halifax on her semi-regular liner service. Karl Risser, our new Atlantic region inspector, wanted to pass along an observation on how good it felt to see the return of a crew who just months earlier sailed into port without the protection of a labour agreement – and now were back with higher wages, better leave pay and better insurance for injury or loss of life. For ro-ro crew, who sail under risky conditions and face injuries daily, that last part means a lot. The ships have a unique design that poses challenges: slight cargo shifts can rattle their stability, low freeboard can leave doors submerged when they list, and the lack of bulkheads lessens watertight integrity and means fires can spread faster. The Goodwood is owned in Japan and controlled by Zodiac Maritime Ltd., a company known all too well to ITF inspectors. Late last November, during an ITF labour inspection in the Port of Halifax, we determined that the ship was not covered by a valid collective bargaining agreement (CBA). That’s when Risser and our retiring Atlantic region inspector Gerard Bradbury swung into action. They began pressing the owners and charterers for a new CBA. Working along the ship’s trading route with our German inspectors and with the ITF Agreements Unit in London, we signed the vessel on Dec. 21, just in time for Christmas. The new CBA means significantly improved working conditions and salary, especially for the lower-ranking crew. And it showed on their faces when they sailed back into port this week. They were happy. So Karl wanted to offer big thanks from them to Gerard Bradbury and to Susan Linderkamp of Ver.Di, the German general workers union, for their hand in the increased benefits and wages. When Karl asked about their home union, he says many identified themselves as proud members of the Marine Transport Workers Trade Union of Ukraine. Karl, who’s always proud to point out he started out with the Marine Workers Federation, reminded us of that small moment of connection we feel when we stand together as workers and identify ourselves as part of a solidarity movement in our own lands. Saying it out loud, worker to worker, means something. So it was good to hear them speak proudly of their Ukrainian ties. It was equally good to have helped secure them an agreement. Working aboard ro-ros is a risky way to put food on the table, as news from the shipping world this week reminded us all. Anyone who follows maritime events will be familiar with the recent foundering of the MV Modern Express, a Panama-flagged FoC ship. As of today, salvage plans were under way to recover the stricken vessel as it continued to drift without crew in the Bay of Biscay off the west coast of France. The crew of 22 were rescued Tuesday after cargo of timber and construction machinery shifted and left the ship listing by 40 degrees in high seas and gale-force winds. Because the Modern Express is covered by an ITF CBA, the evacuated crew will continue on wages, and have insurance to cover lost personal belongings and any injuries suffered. So it’s been a week full of great reminders — on the value of bargaining together for decent working conditions, and on our brothers and sisters at sea who make it all worthwhile. The MV Goodwood, an F0C ro-ro vessel, conducts cargo operations during a regular call in the Port of Halifax.